However, not all money resolutions are good ones. Some of them might become an obstacle towards your financial wellbeing and, even worse, undo any benefits that you accumulate throughout the year. Let's start the New Year with a bang by avoiding these four bad money resolutions. New year, new you. So, by extension — new year, new car, right? Not so fast. From a purely financial perspective, a new car is always a bad idea because a car loses over 10% of its value in the first year due to depreciation. A car is not an investment because it virtually always loses money due to maintenance, insurance, and registration costs. According to Edmunds.com, a $25,000 new automobile purchase generates an estimated total cost of $33,604. It's true that the average interest rate on a 60-month new car loan is now lower than in the last five years, but that's not the full picture. As more Americans are taking out car loans, the prices of cars are increasing. This means that the average car loan principal is getting larger and larger. By purchasing a car that is over a year old, you avoid the 10% depreciation hit and the higher tax and insurance costs. It's a good idea to buy used cars from a dealership that you trust and that offers a comprehensive warranty. Remember that not all automobile warranties are equal. Also, consider buying a car only when you can pay cash for it. Assuming a loan balance of $20,000 and a car loan rate of 5%, you would pay $1,000 in interest in the first year. That money would be better used towards paying down other debts. However, If you are in dire need of a reliable vehicle and need to take out a car loan, then limit your monthly car payment to 20% of your monthly income after taxes. Here's the scenario: When you file your taxes at the very last minute in April, you suddenly realize that you owe Uncle Sam a lot more than you expected. You promise yourself this won't ever happen again, so you update your W-4 form with your employer to withhold more than last year. The problem is that now you withhold way more than it's actually necessary. In fact, every year, 75% of Americans withhold too much tax. It's a good idea to withhold a little bit extra in order to avoid owing taxes on April 15th. But the average tax refund in 2013 was over $2,800, meaning that "little bit extra" was probably too much. The IRS isn't a bank and it won't pay you interest for your taxes. You're better off withholding the right amount of taxes and putting the extra in an interest-bearing savings account. Updating your W-4 takes very little time. Before filling it out, figure out how much you need to withhold in federal taxes based on your income and set your W-4 accordingly. How much is exactly "more"? $100? $1,000? $5,000? What is your time frame? Summer? Your birthday? Christmas? Do your other resolutions prevent you from saving? If you're planning to join a gym and bike to the office, are you going to have money leftover? Are you cutting back on other expenses? If so, which ones? The concept of "go big or go home" doesn't apply to saving. If you want to improve your chances of saving this year, you need to be as specific as possible. Establish your reason to save. For example, "I'm saving for a mortgage down payment" or "I'm saving to replace my desktop computer." Specify a dollar amount. Unless you have that number, you won't be able to know if you have reached your objective. Calculate how much you need to put away per week or per month to achieve your target number. Set up an automatic transfer from your checking account to a separate account, such as a savings account, every week or month to force yourself to save. Take advantage of mechanisms to block the access to your stash until the deadline. For example, if you're saving to buy Christmas gifts with cash, you could use a Christmas savings account (also known as a "Christmas Club" at some credit unions). Determine what activities and expenses you need to cut back. Remember that the savings money has to come from somewhere! More and more Americans are treating their retirement accounts as revolving lines of credit. Unpaid balances become part of your taxable income and receive an additional 10% tax penalty from the IRS. Let's start 2015 on the right foot! 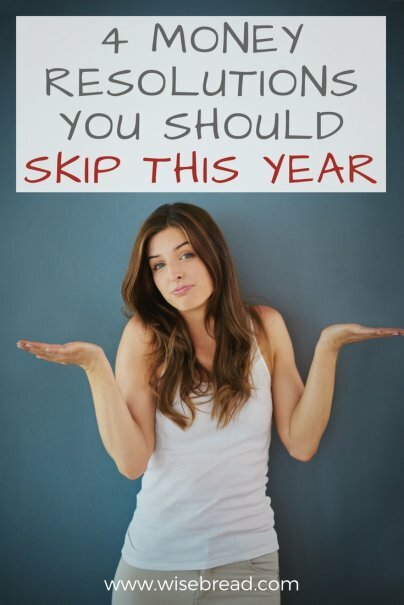 What are some other bad money resolutions to skip next year? Please share in comments!